President Mohammed Morsi denounced the move as a “full coup” by the military. After the televised announcement by Lt. Gen. Abdel-Fattah el-Sissi, the Army chief, that the president has been ousted, millions of anti-Morsi protesters in cities around the country erupted in delirious scenes of joy, with shouts of “God is great” and “Long live Egypt,” Associated Press reported. Fireworks burst over crowds dancing and waving flags in Cairo's Tahrir Square, one of multiple centers of a stunning four-day anti-Morsi revolt that brought out the biggest anti-government rallies Egypt has seen, topping even those of 2011. 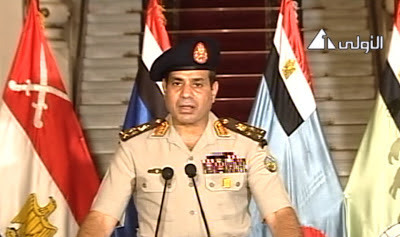 In his speech, Gen. el-Sissi said the chief justice of the Supreme Constitutional Court would step in as interim president until new elections are held. A government of technocrats would be formed with “full powers” to run the country. El-Sissi spoke while flanked by the country's top Muslim and Christian clerics as well as pro-reform leader Mohammed ElBaradei and representatives of the youth opposition movement behind the wave of protests. The constitution, drafted by Morsi's Islamist allies, was “temporarily suspended," and a panel of experts and representatives of all political parties will consider amendments. Morsi was elected with 51.7 percent of the vote in last year's presidential election. Those who took to the streets this week say he lost his electoral legitimacy because he tried to give the Muslim Brotherhood and Islamist allies a monopoly on power, pushed through a constitution largely written by his allies and mismanaged the country's multiple crises. Those actions show that new lovers of a western democracy have to be supported by the military means. Maybe in Russia or Iran: some time in the future, opponents may need to use that ("democratic") examples from Egypt and Turkey, to restore "proper order" by resorting to the army's actions.. So far, the Islamic Republic is run orderly and it doesn't need a bloodshed wished by its outside and internal enemies, as it has been happening in Iran's neighboring, and supposedly "democratic" countries. Egyptians couldn't tolerate Islamists for one year. Yet Iranians had to put up with them for 34 years.Egyptian people are very wise. US/Zionist plan for total destabilization of Arabs is underway as devised by arch-Zionist Kissinger in 1973. Egypt is heading towards full scale civil war and collapse. The IMF/World Bank (Jewish Banksters) funded dam on the Nile in Ethiopia is no coincidence. Egypt will face a massive famine in the next 5 years as it has the fastest growing population in Africa and less than 1% arable land. Egypt is totally dependent of Saudi, Qatari, IMF/World Zionist bank charity to feed its 84 million uneducated and illiterate fellahin. Its corrupt military is bought and paid for by the US and can not even get gasoline for a single truck without the Cairo CIA station chief's approval. It is a shame what the once proud land of the Pharaohs has become. But then Egyptians were always a colony of some foreign power since the Roman Empire. A corrupt divided land of slaves made worse by foreign interference, corrupt government and manipulation by Wahabbi/Salafi Islamists and their western sponsors. Is it any surprise that we hear major tragic news coming out of another Arab country, as opposed to the civilized Western hemisphere? Usually when the military junta gets to power then it means that things have gone from bad to worse...they have hit rock bottom, so they might aswell take their chances with an invasion of Zionistan. The portion of the population loyal to Morsi has vowed to fight back in one way or another. The Muslim Brotherhood will not let the reigns slip out of their hands that easily and are in the process of rallying its supporters to confront this illegal move by the military. And after they are done and put everything back in order, there will be hell to pay amongst the traitors in the military ranks. How will the majority that elected Morsi react? And what happens if the MB win the next election? This is sort of looking like the direction Turkey took in the period spanning the 1960s through 1980s. It was especially bad when I visited there in 1975.
might be that wherever you are, whenever you're there, things are bad. Also, it is quite idiotic to think Iranians are putting up with Islam. They are Muslims and most of them are pretty damned good ones. No! In South America there is a saying that the reason why there is no coup in the US is because there are no US embassies on US's soil. Of course it is not a surprise. If the Arabs had spent so much blood, money and resources in fighting the Zionist cancer, rather than killing and beheading each other, perhaps they would have had a future. But, then the British homosexual Major T.E Lawrence who manipulated he Saudis and then Trans-Jordan into a revolt against the Osmani Turks, summed it right, "the Arabs are a childish, petty, barbaric people with each tribe against the other and brother against brother". No wonder the US/Zionists are supporting the Wahabbi/Salafi cannibals. This event has so much of operation Ajax in it, I wonder and am amused at this level of predictability. Good or bad, this democratically elected Egyptian was toppled as was Mossadegh half a century ago, because he was awkward. I know he was an arse, but an elected arse none the less. As someone we all know once said, to colonise a nation you need uneducated peoples and a handful of traitors. MARK-the supporters of Morsi are there by their millions! !,very disappointed by an imbecile of a president who let them down in a record short time!-Even the Saudis though a tool of the west know how to package themselves in-front of the masses.MORSI is joke! there was no need for him to show some extremism by cutting ties with Syria in broad daylight.surely the list of blunders is long for his supporters to bear!. To the same three anons above. Yes it was a coup.But a coup with a difference because it was supported by the vast majority of the Egyptian people who were fed up with Islamist ways. I will put down your name calling of me as a "jealous jewboy" to a sign of immature and imbecile behavioural itellect. Ask most Iranians and they will tell you they are not Muslims but Zoroastrians.Even a son of a mullah told me this.Iran has been forced to put up with a minority of Islamist for 34 years.Why else was the Revolutionary guards and the basij created? Egyptian people are Muslims and they retected Islamist.So being Muslim doesn't mean you have to put up with Islamist. End of the day Islamists are Islamists,be it Shiite or Sunni because they are all fanatics. Make your mind up.Are the Egyptians Zionist sponsored and Western backed suckers or Wahabbi/Salafi Western backed lunatics? You come from South America? The traitors were the Islamist Morsi government.Good riddance! I lived through the LA riots. Americans are worse. That's because the shia use mozdors,basij and revolutioary guards to crush any real opposition.But don't worry every dog has its day.Happy barking! Wrong.Mossadegh was selected by the Shah and approved by Majles. Morsi was democratically elected by the people of Egypt. Mossadegh went against the constitution by trying to close the parliament and wanting to become commander in chief of the armed forces. Morsi was trying to ram Sharia law down peoples throats. But as that person said about colonising a nation.That's what happened to Iran in 1979 when a bunch of uneducated Islamist traitors took over a country and forced their nonsense down peoples throats.An old saying,look up a mullahs beard and you will see,Made in Britain. Thx God the likes of you anon 1:01 pm were flushed out for good from Iran. BMA, I agree with your analysis that Morsi had showed his lack of maturity by ignoring solutions proposed by Iran and B. Assad. However, I believe that Morsi's outside enemies took advantage of that situation in order to pursue their goals behind the backs of an emerging confusion in the Egyptian society. For instance, the removal of Morsi, and marginalization of Muslim Brotherhood, can benefit Zionist entity with an elimination of the Hamas and bringing to power an amalgam of "organizations", which will implement Western wishes for money. From the Iran and Assad's point of view, the troubles in a governance of the Egypt may bring Palestinian loyalty back and give a time to Assad and the Islamic Republic to advance their military strategies...before enemies might be able to extend their expanded control of the Egyptian society and dictate their wishes.